If you are like me you have been eating too many rich, sweet, heavy foods and are ready for something tasty that is healthy. 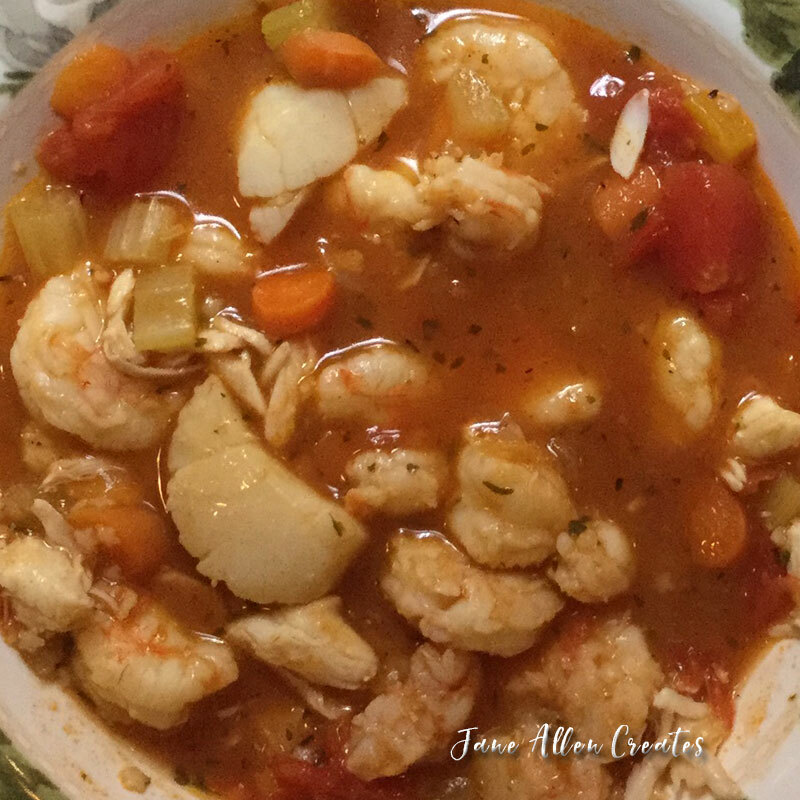 This seafood chowder is a nice light meal, but still seems like you prepared something special for your family and guests. It would make a great New Years Eve dinner, pared with a salad and some nice bread. I often make this chowder for Christmas Eve. To make the chowder you first need to make the stock. I usually do this earlier in the day or a day ahead. Prepare stock: In a 4 quart stockpot, add all stock ingredients and bring to a boil, then lower heat and simmer for 20 minutes. Strain through a fine-meshed sieve into a large bowl and discard the solids. Cover the liquid and set aside. While the stock is cooking you can chop the veggies for the chowder. Prepare bisque: In a stockpot, melt the butter over medium-high heat. Add the onion, carrot, pepper, and celery and cook, stirring occasionally, until softened – about 10 minutes. Add the garlic and cook for 2 minutes more. Stir in the parsley, flour, thyme, tomato paste, salt and black pepper. Cook and continue to stir for 1 minute. Stir in the stock and bring to a boil. Reduce heat to medium-low and allow mixture to simmer for about 20 minutes. Add pasta and cook for 10 minutes. Add shrimp and scallops and simmer until just done about 5 to 10 minutes. Stir in the crabmeat and simmer until heated through. You can substitute the seafood to your liking. Looks Yummy especially on a cold cold cold nite! Thanks Amy, it is a favorite with us. Thank you Effie, I hope you enjoy it.